Cats aren’t always the easiest pets to keep entertained. Yes, some kitties are remarkable in their ability to cure themselves of boredom; my mum’s cat, for instance, will even go so far as to choose a toy out of a basket, pull it out himself, then play with it for some time with no human intervention necessary. I’m convinced that these types of cats are rare, however, and that most cats need a lot more help from people to cure themselves of the boredom bug – especially when we humans aren’t around for them to entertain themselves by watching us, say because we’re at work or (for those of us who work from home) because we go out for hours in a day. Mine most certainly does. My cat Avery is actually quite a lazy cat, especially when it comes to playtime. He needs a great deal of encouragement to get him to play. While it’s easier for me to find things that entertain him than it is to find ways to get him to exercise, it’s still difficult to entertain him some days. Then there are kitties I’ve met (some I’ve even cat-sat, actually) who make trouble whenever they’re a bit bored – get themselves into places they shouldn’t be in, meddle with objects they shouldn’t be touching, you get the picture. Basically, with cats like these, entertaining themselves becomes synonymous with getting up to some mischief. 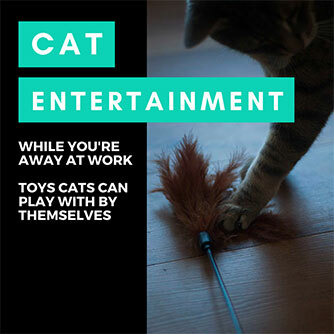 If you’ve got a cat that needs help curing his/her boredom, and needs help staying entertained indoors, it’s time to work toward making sure your home has enough engaging things for kitty to do, look at, watch, etc. to keep away the boredom bug. Because while it’s exceptionally important to make sure kitty gets his/her daily dose of high-intensity exercise, it’s also very important to keep your cat entertained and amused throughout the day during times when he/she doesn’t necessarily want to expend too much energy. Okay let’s get into it! And of course, if you’ve got any other ideas, please do let me know what they are in the comments. Advice is always welcome! 1. 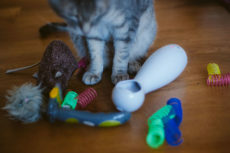 Leave out different types of toys that kitty’s able to play with on his/her own. Now, this won’t work out for every cat, as lazy creatures like my own Avery will rarely ever touch a toy on their own, but it does work out for the vast majority of cats. 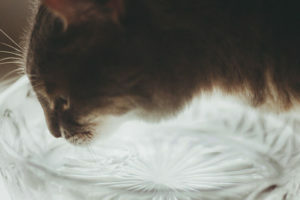 If you have a regular, or a playful cat, having a slew of these types of cat toys can work wonders. In terms of toys that work out well for this type of thing, I’d recommend products similar to: bouncy balls, cat springs, and cork eggs. If they’re easy for a cat to hit, swat at, and jump on, they’re game. Most toys cats can play with by themselves are also pretty durable, which is a huge boon because it means you can have a large variety without needing to replace any very often. There are also ball track toys, toys cats can jump and grab, cat kick toys, and catnip toys that work really well for this type of use. Looking for more suggestions? 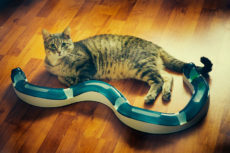 Check out this list of cat toys kitties can play with by themselves. 2. Try new toys, and change in and out toys every once in a while. Trying new toys is something I constantly have to do anyways since my cat is such a lazy little bug and I really need to make sure I have backups in case he ever goes cold turkey and stops loving a toy he’s been obsessing over for months (yes, this frequently happens with Avery!). 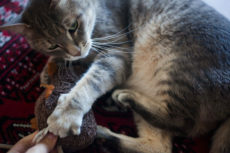 My best advice for expanding the number of actually-played-with cat toys you have in your arsenal: if your cat seems to really like one type of feature, or one type of toy, try to get your hands on unique variations of those cat toys. For instance, if your cat really likes feathers, get different types of toys with feathers, or if your cat really likes balls, try out one of the many varieties of cat toy balls. While to keep cats passively entertained, you’ll want to grab as many varieties as you can of specifically toys cats can play with by themselves, interactive cat toys where you only need to press a button are still excellent options to have around, in case there are times you are home, but are just a bit too busy to do the waving around of the cat wand yourself. My favourite of these are currently automatic laser toys, because for now, Avery actually engages with these every so often. 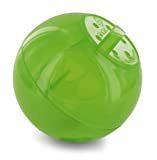 You can also try feeder toys, like the Petsafe SlimCat Interactive Toy. 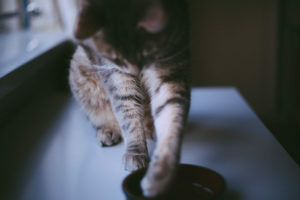 Obviously, like interactive cat toys – these are not completely passive either (because you have to fill them), but they do work very well at engaging cats for short periods of time, especially if they’re anything like mine and are quite obsessed with food. Leaving for a while? Filling one of these and placing it for your cat to use before you go is the perfect way to make sure kitty doesn’t just cat nap while you’re out. In terms of switching cat toys in and out – while this works with many cats, it doesn’t always work out as well as I feel you might hope. Especially with some toys, if your cat grows bored of them, that’s it and it’s time to move on to a new type of cat toy. That being said, changing toys in and out is easy enough to do, so you might as well give it a shot in case it helps kitty stay entertained. 3. Out for long hours? Use timed feeders to encourage your cat to wake up and move around. We all know how cats can be when we leave the house – that Pokemon Snorlax? I’m convinced he was based on the personality of a cat. Cats sleep for most of the day for good reason, but that doesn’t mean it’s not a good idea to encourage them to wake up, move around, and actually engage with those home alone cat toys while you’re out. And the perfect reason to get up for nearly any cat? Food’s being served. 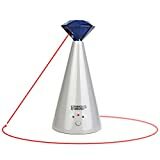 Timed automatic pet feeders can come to the rescue in cases like this, and are beneficial in general if you’re not always home at the same time every day (since cats really do love routines). They can help you fix quite a large number of behavioural issues you may have encountered with your house cat: from him or her eating too quickly, waking you up at night, waking you up earlier and earlier each morning, begging for food all day – these handy devices can even help you prevent overfeeding, all while likely pleasing your cat, because honestly, who wouldn’t like eating more often? 4. Grab pet furniture/cat toy hybrids cats can play in by themselves. I’m crossing my fingers that a lot more of these pop up on the market in the near future because there don’t seem to be enough of them out there yet. What types of products am I talking about? 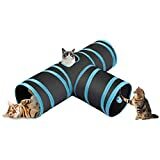 Toys like the ever-so-popular and inexpensive cat tunnel I feel belong here, amongst the few cat furniture pieces that are ever-so-likely to encourage cats to play in, even on their own. Since they’re so easy to have lying around and so helpful for curing cat boredom, the only downside to these as I see it is that there aren’t more of them around. Luckily, what I think is probably one of the coolest furniture-toy hybrids that will ever hit the market has already been invented: the Snuggly Cat Ripple Rug. I sadly haven’t been able to get my hands on one of these yet because they aren’t yet available in the UK for an affordable price, but based on the reviews I’ve seen, cats will often play and hang out in them by themselves for ages – some even taking their “prey” like sisal mice back to their lair hidden away in the depths of one of these. Needless to say, I can’t wait to try one of these out when I finally get the chance. 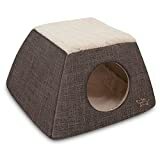 While doing some digging for my article on cat trees with leaves on them, I found one more piece of cat furniture that might work out well for this type of thing – this On2Pets CatHaven Cat Condo, which I think any cat would love playing grab-the-toy from while hiding inside. It’s very different from the other hybrids, and is an idea I’m hoping to see a lot more companies mimic, as let’s be honest, cats sure do love to see yet feel as though they can’t easily be seen. 5. Leave out some cardboard boxes, paper bags, and the like. 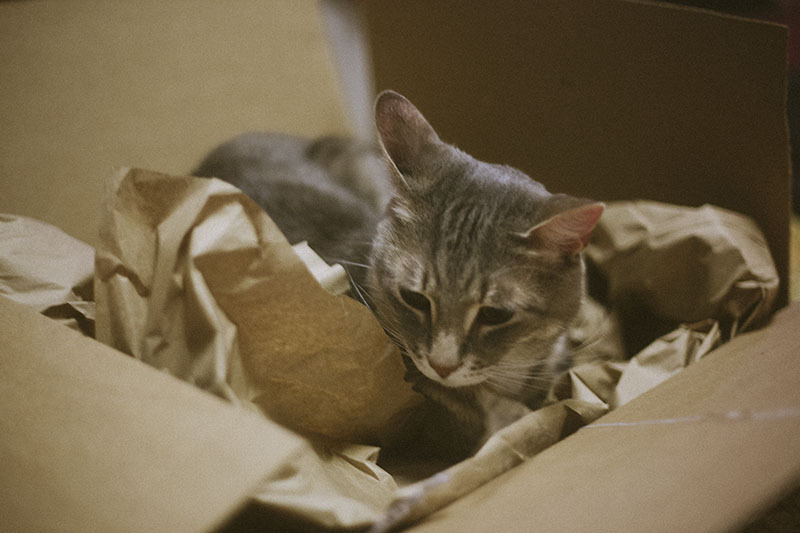 Cats really do love their cardboard boxes. All boxes for that matter, but cardboard ones do seem to have slightly more allure. Get a lot of packages from Amazon? Visit supermarkets that have cardboard boxes for you to take free often? Grab a box or two for kitty. Try to get different sizes, with different shapes (long rectangle, square, etc. ), some without holes and some with (for handles or air holes for the veggies they used to carry). Grab a diverse bunch if you have any control over the matter. Once kitty is bored of a cardboard box or bag, move it to a different location. Turn it on its side, put two together that weren’t stacked next to each other before – move some back to back. Cat still bored? Throw out the cardboard boxes kitty’s no longer interested in and replace them with other ones if you can. Just keep a steady stream of these different sizes and shapes coming if they’re free for you to grab anyway. 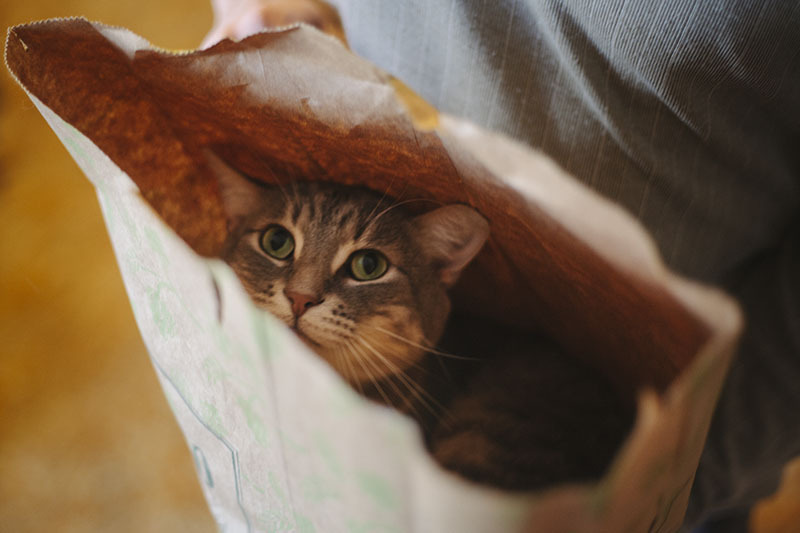 If your cat likes paper bags or re-usable shopping bags – try leaving those out for kitty, too. Again, relocate and put away if your cat’s gotten bored of the original location, but simple things like these can really help cats entertain themselves. 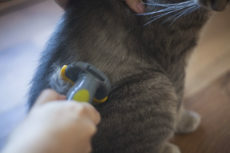 Whether or not your cat loves to be petted, your cat is still a cat, and so he or she is definitely into stimulation via grooming of one type or another – even if it’s only the self-grooming kind. 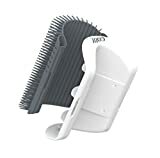 The best way to use this to your advantage, making the most out of a cats’ passion for grooming in a way that will help keep a cat from always being bored? 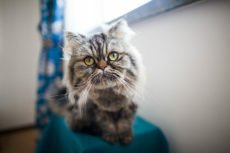 Grab a self-groomer or two, and attach them to easily-reached places on walls where kitty frequents. Don’t like the idea of drilling into the walls? Try a cat grooming arch instead. They can be very good for cats who always want cuddles and attention, as, while they’re certainly not as good as human petting, they certainly are better than nothing. Cat really digging the massage toys? You may also want to give the Catit Senses Wellness Center a try. One of the very few cat toys on the market right now that’s specifically designed with feline self-grooming in mind, and has a variety of different textures for a cat toy enjoy. As with everything, not every cat is going to be a fan of this one, but it seems many often cats are. 7. Increase vertical space in your home: make sure there’s plenty for kitty to jump on. I’m a little biased with regards to this one because of the amount of time I’ve spent in a single, small room with my cat Avery over the years. Thomas and I have lived in what most would consider small spaces with Avery for, I’d say, roughly 6 years so far, and we’re still in a studio flat, so it’s not like Avery has a crazy amount of space to work with now. 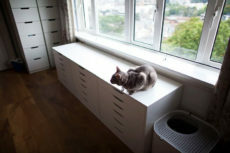 How do you get around small living spaces and keep a cat happy and entertained in tight quarters? The trick I’ve found works like a charm: make sure there’s plenty for your cat to jump on. Cats don’t care if they have space horizontally or vertically. Of course humans do – we can’t jump on the tops of dressers or stand at the very top of a bookshelf – so it matters more to us that there’s space in the length and width of the room. With kitties, if you just add more dimension – nooks and crannies high and low for kitty to sneak into for naps, chairs that kitty can jump on the back of, then jump onto a dresser, then onto a bookshelf – there will be absolutely no problem with regards to feeling tight on space from kitty’s perspective. Have plenty of room? Throw in a massive cat tree and kitty should be happy as a clam. Willing to drill into your wall or ceiling? Make an awesome cat wall out of jumping shelves or hang a floor-to-ceiling tree. Don’t have much space, but can’t or would rather not drill into ceilings or walls? Try a narrow cat tree or hang a cat climber on a door instead. I can almost guarantee your investment will be worth it. Cats adore spending time jumping from one spot to another, and they love spending time high up above watching the goings on of the house and napping in these high spots as well. Push furniture closer together and make it easy for kitty to jump from one item of furniture to the next. I’d recommend having a small sofa or couch under a window, then having a tall dresser/chest of drawers right next to the window for kitty to jump onto and peer outside the window from. Then if you can, put a book shelf next to that dresser. If you have a mantle, clear that off and make that accessible for kitty to jump onto. If your cat is uncomfortable jumping high enough to reach the mantle, put a footstool or re-angle a sofa near that spot so that kitty can be happy jumping from the footstool/sofa to the mantle. Same goes for tall dressers or bookshelves – have something shorter for your cat to use as an in-between step. Have kitty practice jumping on things that are meant for him/her to jump on by luring your cat with food. If you do this, you’re basically telling your kitty it’s okay to be on these specific surfaces, which will make it much more likely your cat will use these surfaces as intended in the long run. 8. Increase napping spaces: make sure there are plenty of little spots for kitty to get into. This doesn’t have to be complicated. Have an Ikea Kellax bookcase or something similar? Leave one spot empty near the bottom for kitty. Regular bookshelf? Line the bottom shelf with your cat’s favourite blanket. He or she should take to napping there in no time. 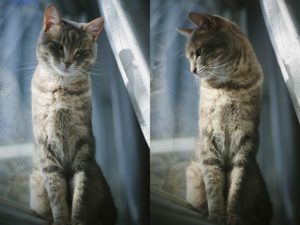 You can also grab a cat perch/window seat for your window for your cat to spend his/her time in. Have a couple rooms that kitty particularly loves the view from? Get one perch for each room. I’ve even seen two or more perches on the same window at different heights – excellent for showing kitty the beautiful view from different vantage points. If you’ve already got a number of spots your cat frequents, you might be wondering why you’d need more. The answer is simple: cats love spending a little time here and there, checking in on their favourite spot, then moving to their next favourite spot, and so on. They can entertain themselves for hours moving from spot to spot, taking a nap here or there, checking on birds outside from different vantage points, even if it’s all from the same window. Cat entertainment isn’t complicated, but it does have to be well planned and as diverse as possible to make sure it’s hands-off from the perspective of a cat-keeper. 9. Keep kitty on his/her toes: move things around every once in a while! Now, of course when I say this, I don’t just mean shoving the cat tree an inch or two (or ten) away from where it used to be. Yes, that’ll throw kitty off, but it definitely won’t be considered entertaining – just a minor nuisance. I mean literally moving whole cat trees from one side of the room to the next, or swapping the location of a cat tree to a while new room completely. Rearrange furniture as well if you’re happy to do that. You can also switch books off a shelf and onto another to give kitty a “new”/different place to cat nap in, and move those cat perches/window seats from one window to another as well. I’d especially recommend moving something if that particular cat spot is not getting much use anymore and it once got quite a lot. A simple move can be the difference between a cat tree getting no attention to getting used for naps 2-3 times a day again. It’s like breathing new life into a cat product you’ve already got lying around – much better than feeling like you have to grab new products. 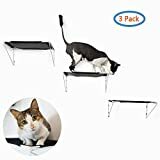 As a heads up, this is much easier to do on the regular with small cat trees, so if you find your cat really enjoys this tip, you may want to grab 1-2 of those (especially ones like the Trixie Baza that have integrated cat beds/hammocks) rather than large cat trees that are harder to move around. You can also tell quite easily if your cat preferred an item in an old spot – before the move. Basically, if your cat spends less time on an item after the shift, it’s time to move things back. Also, if you find your cat staring at a spot a cat tree or other cat nook was that’s now vacant since you moved the item, it’s a sign it’s time to move that cat nook back, because your cat misses hanging out in the old location. Hard to move the cat spots in your place because you like the way things are currently arranged? Grab a couple cat cubes and move these around regularly. Cat really love warm spaces? Try self-warming cat beds to use in the same way. You can hide these under tables, stick them beside the couch or the TV, even throw them up on top of a dresser. Kitty is much more likely to follow them to a new spot considering his/her scent is already on them after sleeping in them a few times, and they’re one heck of a lot easier to move around for us humans than rearranging furniture. Really like this idea, and want to maximize it’s potential? 2-in-1 convertible cat cave / cat bed hybrids, like the Best Pet Supplies Cat Dome, should really help on this front. You can switch up not only where the nap spot is located, but also how it looks and feels to kitty, lickety split and without having to invest in yet another cat item. Added perk? They’re usually just as inexpensive as regular cat beds that don’t convert into cat caves. It’s true that cats don’t like change – but this is only true to a certain extent. Cats like change that’s not seen as frightening or threatening. Heck, even cats gets bored of how things are if they’re that way for too long, and want something novel to happen every once in a while. I’d bet while you’re shuffling things about, your cat may just stare at you intently the whole time, curiosity brewing, then investigate once you are done, for hours if your change happens to be big or satisfying enough for kitty. Getting re-adjusted to the same old stuff in new places is actually quite stimulating, even for people. Definitely true of cats, too. 10. 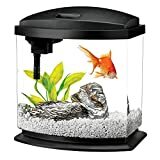 Get a pet fish in a closed off fish tank. Yes, I know I’m basically telling you to get a pet for your pet, but it really does work! My brother took a couple fish in – returns from the pet store he works at – and his cat, Beau, watches them quite often, and even used to sleep next to their tanks at night! This coming from a cat who we’ve all suspected has pica because of the fact that he’s tried and successfully eaten pretty much everything – including the handles of pots and pans, hand towels, shoe laces, and bed covers to name a few things. He’s getting better at not eating so many crazy things now, but the fishes definitely seem to be doing wonders with regards to entertaining him. And yes, they are safe. Cats love to watch fish. We all know this, and yet not many of us like having fish tanks at home because we’re worried about the poor fishies being caught straight out of the water and ending up eaten! If you’ve got a cat-proof or closed off fish tank, though, this problem is solved, and you can reap the benefits of having fishes for cat entertainment without the potential casualties taking place. 11. Place bird feeders on or just outside your windows. The whole bird-feeder-in-your-garden trick for entertaining cats is popular for a reason – it works like a charm! There’s absolutely nothing like a bird feeding near kitty to make him/her completely attentive and in the zone. Not only are cats obsessed with bird-watching, but the fact that there’s a window between your cat and the birds means there’s no potential for casualties in the same way there may be with a non-cat-friendly fish tank in your house. If you’re currently using a bird feeder in your garden as a form of entertainment for your cat, do make sure to keep the feeder well stocked with bird food and that you have your feeders in a place where kitty can easily spot the birds. If not, those feeders need to be relocated. Want to make bird watching amazing for cats? 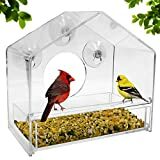 Get your hands on a suction-cup window bird feeder, preferably one that’s made of see-through plastic, and stick that to a window frequented by kitty. These work really well if you’re in an apartment or flat as well, so long as you have birds in your area. Just make sure to keep refilling them when they’re low and to watch to make sure the suction cups are holding well, and you’re all set! 12. Grow some cat grass in your home for your cat. Now, growing cat grass probably works out best for cats who won’t overdose like crazy if you leave the fresh-grown grass out; but if you find you have an over-zealous kitty who has way more than a fair share, you can always hide it away for most of the day and bring it out after meal times for some time, for instance. 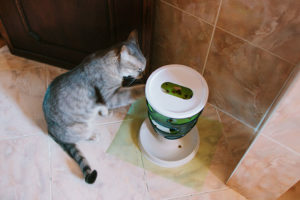 There are ready made kits out there like the Catit Senses Grass Planter in case you’d rather not muddle around and try to figure out where to source proper soil and catnip seeds. Nothing like catnip to help pique a cat’s senses, whether he or she reacts to it by going crazy or not. 13. Leave your TV on playing videos for cats with the sound up. 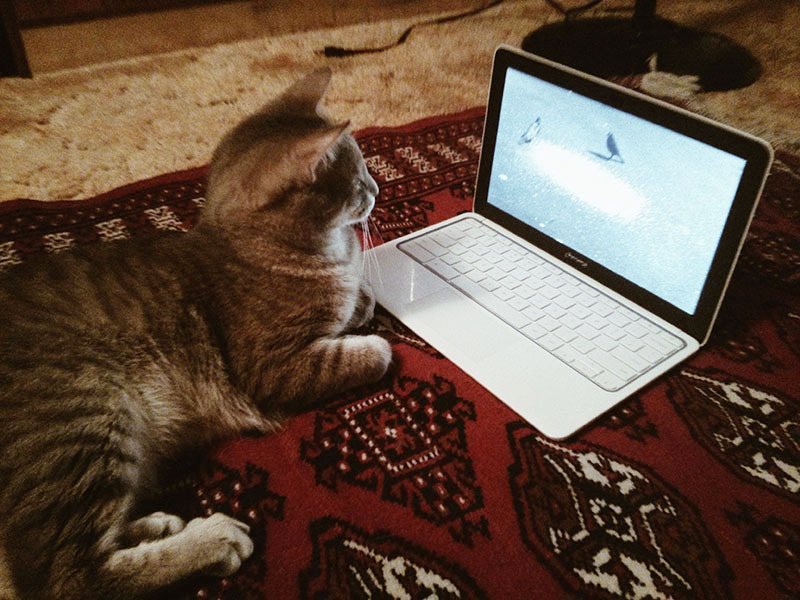 If you’re having a hard time getting birds to feed in your area, can’t place a bird feeder near or on your window, or just plain need something for kitty to do at night when birds aren’t out feeding, try some cat videos to keep kitty entertained. 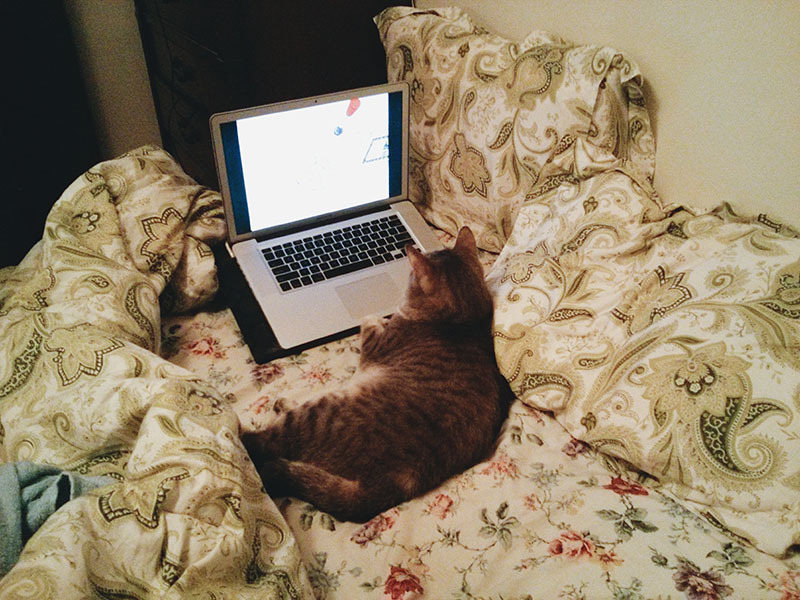 Avery loves watching cat videos, as does nearly every cat I know. I used to seat Avery in front of my laptop or Chromebook and watch him watch birds & fishes go past, but this would work so much better on a TV with the sound up. There are plenty of free-to-watch videos for cats to go through on YouTube, and if you want some more options, you can rent/buy videos for cats on Amazon as well. Put these on while you’re at work with the sound up (doesn’t need to be too high, but not on mute!) and kitty should be a lot happier with the passive entertainment. 14. Leave the radio on while you’re out of the house, or play specially made music for cats. I’ve heard that leaving the radio on while you’re out of the house, such as for extended periods of time while you’re away at work, can help keep at least some cats more stimulated throughout the day due to there being different sounds and noises they can enjoy, rather than having to spend the day in monotonous silence. 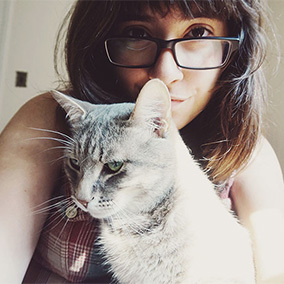 While it’s not a cure for cats who have separation anxiety, some pet parents do find it lends a hand in recovery, as it maybe helps a cat stay distracted or feel as though they have some kind of company, though not a physical presence. If you’re going to use this technique, I’d advise trying different channels – talk channels vs music channels, and different types of music for instance – while you’re home to see if your cat has a preference. If he or she reacts well to some, leave those on while you’re away. 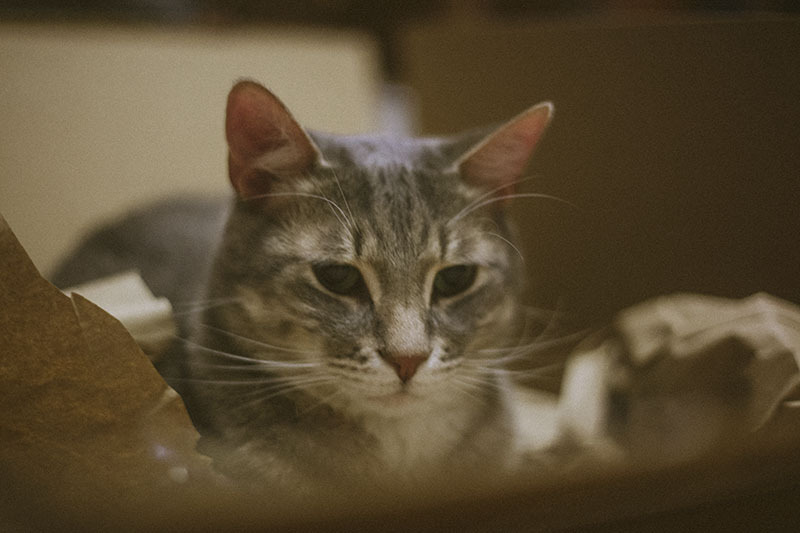 There are also a few people out there making specially made music for cats – primarily to help them feel calm and relaxed, since researchers have discovered they do seem to gravitate toward specific types of music different from what humans gravitate to. My brother from Pets Overload creates his own made-for-cats music. If you’re interested in playing some for your cats to have a listen, check out this page on his cat music site, Catnip Chorus. *Bonus: Have one kitty? Get a second cat to keep the first company. While cats are a lot more independent than many other animals, they still are social animals and often do a lot better indoors with company. Cat lately want more attention from you than you can provide? If your living situation makes it possible, getting your cat a feline companion should definitely be considered. Make sure whatever cat you get next has a similar temperament to the first to minimize squabbles between the two pets, and so long as your first cat is well adjusted, expect a little push back initially, but that the two will keep each other company quite well in the long run. Adopting a second cat is an option that should especially be considered if you’re away for long hours at work all day and can’t have anybody stop by to spend some time with your cat in the mornings. 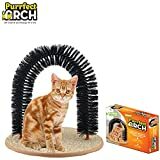 Yes, you still should be using the techniques listed above to keep your indoor cats entertained if you have more than one, but having a second cat will do a very good job of curing any kitty loneliness or fill any need for more attention your house cat might have. These tips have nothing to do with keeping your kitty fit with regular playtime and exercise. If you happen to have a lazy kitty like mine – i.e. a cat who’s hard to get in the mood to engage in a regular playtime – try using these techniques to encourage your lazy cat to play, as well as these tips to get your cat to stay fit by passively and actively encouraging exercising. And good luck, because I know how hard it can be to coax cats like mine into an active playtime! Worst comes to worst, you may have to take a more active approach in keeping your cat more mentally and physically stimulated. The easiest way to make sure this gets done every day? Have a structured, daily routine like this one. Live in a small apartment like I do? It’s a bit harder for us to keep indoor cats happy, but it’s still completely possible to do! 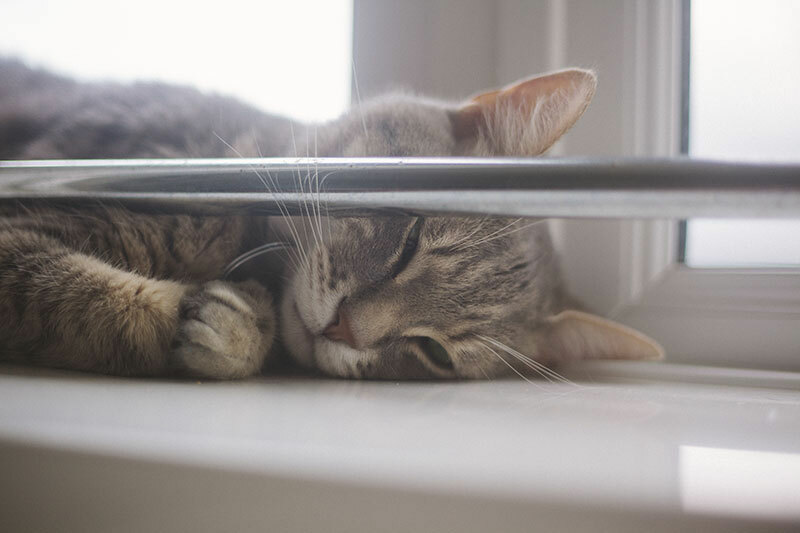 Find out how to make your small space ideal for indoor cat life here. How Do You Keep Your Cats Entertained Indoors? Is there anything you do to keep your cats entertained that I haven’t listed here? Do you do anything special for your cats to keep them from getting bored while you’re away from home, say while you’re at work? Have you tried any or all of the above tips? What has and has not worked for you? Does anything do the trick perfectly by itself? I hung baby crib mobiles or wind chimes on the ceiling near windows and cat trees for my cats to reach and play. Oh that is too cute! I should test this out – sounds like such a great idea!